At last a brunch that focusses on delivering breakfast food! I don't dig those buffet brunches where you are served dishes from all over the world and end up with 5 different cuisine types on your plate. Yack. I just want a coffee, Eggs Benedict and French Toast - all day long. 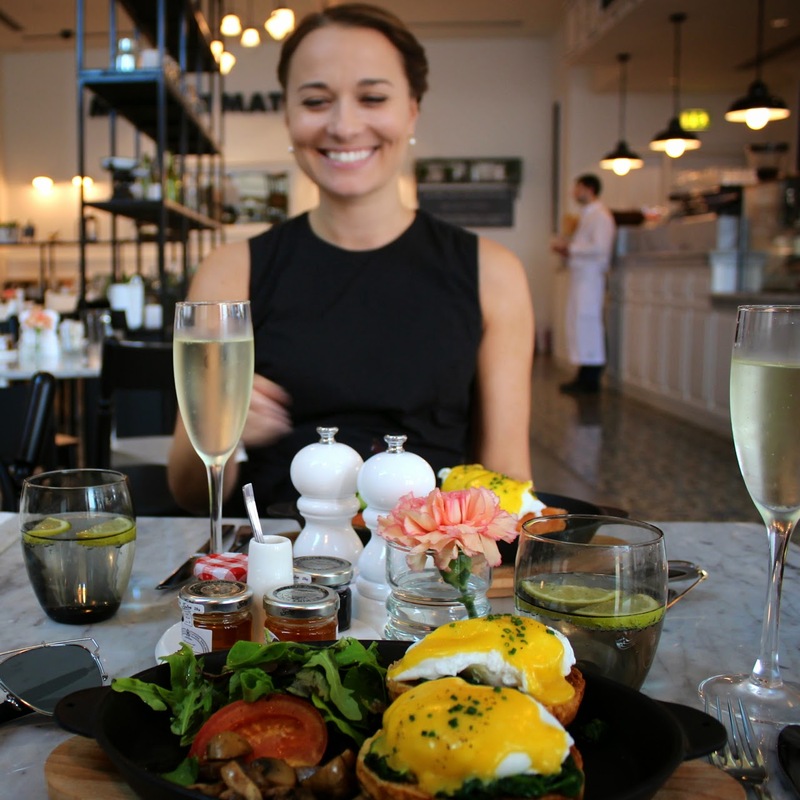 This Bubbly Breakfast involves three courses - pastries (the Pain aux Raisin is sensational), Eggs Benedict and then a choice of either French Toast or a hefty waffle for the final course. This is all served with water, coffee and "bubbly" - AKA not quite champagne but very enjoyable to drink nevertheless. 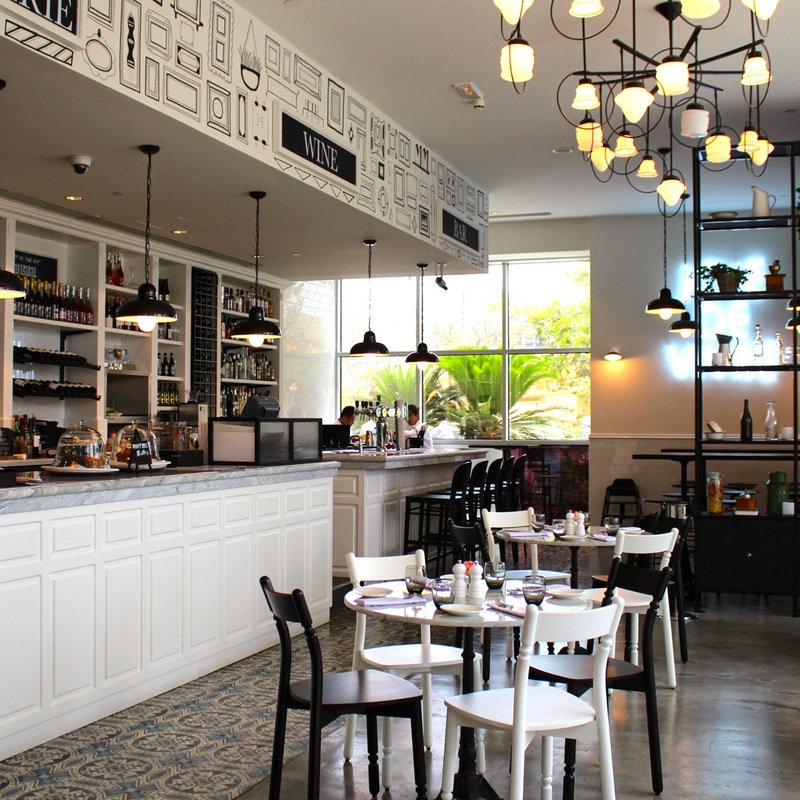 The interior of all Maison Mathis bistros is well considered. It's monochrome with splashes of light wall art and table flowers - very Instagram worthy! This branch is fairly quiet which made us fairly self-conscious of our bellowing laughs (particularly after glass 2 of bubbly) but I much prefer that to a crowded, loud and stressful alternative. If I had one criticism it would be that the pastry dish could do with some presentation revision - each pastry comes on it's own plate when a nice basket could do the job more efficiently. This is a brunch for the laid back breakfast food lovers and at AED 125 per person, including 2 glasses of bubbly, it's one that is also nicely affordable. I really loved this and I will be back. Opt for the French Toast over the waffle - it's melt-in-your-mouth stuff. Not all branches offer this - the Dusit Thani is a hotel, hence it is licenced to offer alcohol. Jumeirah Restaurant Week (JRW) is a big deal. Each year over 40 restaurants within Jumeirah properties offer amazing dining deals, making experiences that would otherwise be considered too costly to indulge in, within reach. 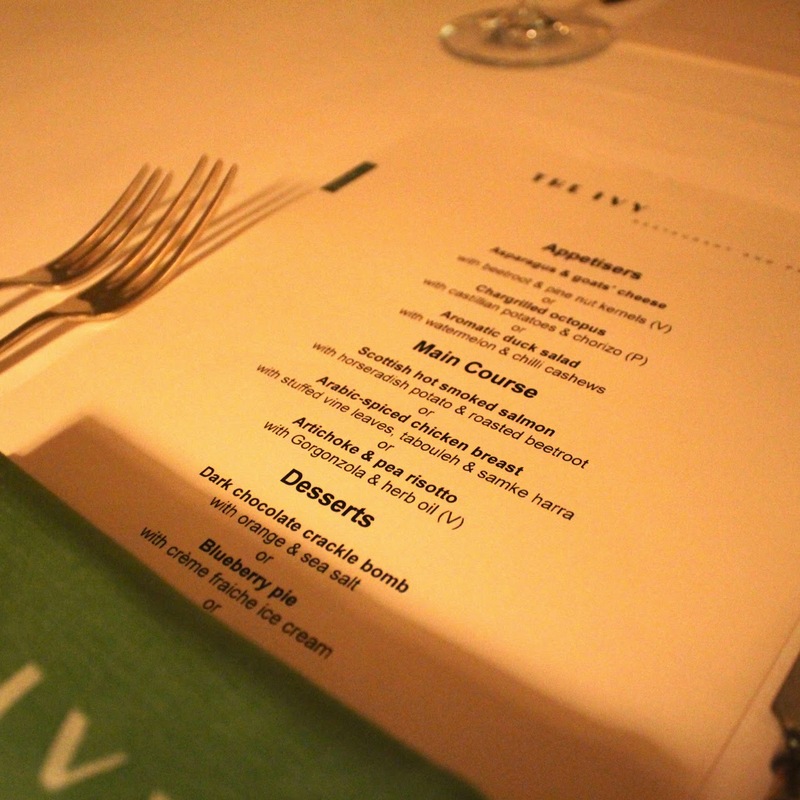 This year it runs from 14 - 23rd May but I managed to sneak in for a preview at The Ivy in Emirates Towers. This is the Dubai take on the famous London restaurant, albeit a bigger more corporate version, and the standard menu sees all the classics like Bang Bang Chicken, fishcakes and sticky toffee pudding. For restaurant week though there has been a departure from what might be considered the predictable choices with the adoption of more varied flavours and styles. I was a little disappointed with this and it would have been nice to have retained a stereotypical Ivy dish for each course because when it came to the main I was struggling to choose between the options. In the end I had the asparagus and goats cheese salad for my starter, artichoke and pea risotto (which was very generous on the gorgonzola) for main and then, then I had dessert. That's really where my focus was the entire time and when I think about the evening I think about a) the nice Pinot Noir and b) the dessert. This was the Dark Chocolate Crackle Bomb. When served hot chocolate is poured on the sphere and it implodes, revealing vanilla ice cream and orange segments. The pictures speak for themselves. The total cost was 180 AED each which I think is great for a restaurant of this calibre. JRW is a great opportunity to try all those restaurants that I have always wanted to visit. If I wasn't buggering off to the UK next week then I would definitely be stuffing my gob at various establishments around Dubai. If you are around - either living/visiting - check out the options here (Link!) and get booking because this is a highly popular event and tables sell out fast. Brunch looks incredible and my kinda day. This is noted for when I eventually get over to Dubai hopefully this year. I too could eat this all day every day and miss this as you cannot get this here in Monaco .... its criminal. That Chocolate bomb though. Do you think you could go there and just opt for dessert? Your food photos (along with all the others on your page) are AMAZING! Breakfast/brunch is my hands down favourite meal to go out for. Except I don't eat eggs unfortunately. So yeah, give me all the waffles, french toast, pancakes, cornfritters and granola!! YUM. That dessert though. Wow. Laura, expect my dry cleaning bill in the post. Drool requires special attention, not machine washing. I would kill for eggs benedict right about now! Oh look at that dessert, it looks amazing! Great post Laura, as always. The food here looks so great! Thank you for sharing the review!